Get convenient filtered water on demand from the OMNIFILTER-CBF1-S-05 undersink filter system. The CBF1 can be easily installed on any standard 1/2-inch water line and comes with a lead-free faucet for easy dispensing of filtered drinking water. The OmniFilter CBF1 filter system comes with one CB1 carbon block replacement cartridge that is certified to meet NSF Standards 42 & 53 for contaminant reduction. The OmniFilter Undersink Filter System fits standard 1/2-inch NPS supply threads. The filter uses Activated Carbon Block to remove contaminants for up to 6 months. 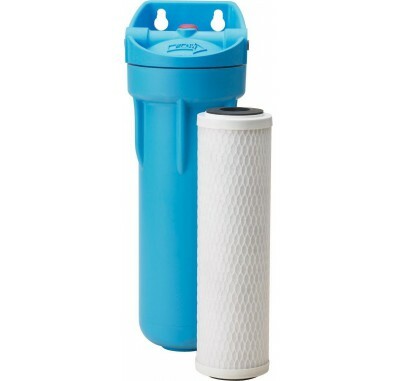 Complete system includes faucet, filter cartridge, and mounting hardware. Lead-free faucet dispenses filtered water easily into pitchers and glasses. Easy to install on 1/2-inch water lines. Built-in pressure relief button makes filter changes fast and easy.